The official opening of the Haus der Bürgerschaft - Parliament House - in September, 1966, marked the culmination of a 120-year development for the state legislature. The Bremen Parliament attempted in vain since 1848 to acquire its own premises. Until 1966, the representatives occupied other buildings: for many years the Stock Exchange, which was destroyed in an air raid in 1943, and later the Town Hall, the seat of Bremen's government, the "Senate". The new building on the east side of Bremen's Market Square was the subject of lively and controversial public debate for over a decade. Should an historical replica be built, or should the contemporary style of architecture dominate? In the end, it was the view of August Hagedorn, then the President, that prevailed. He had the courage to try something modern. A design - altered several times- by Wassilli Luckhardt, a Berlin- based architect of international standing, was realized. Luckhardt's designs and buildings were characterised by the style he helped to found: the "New Building" of the classical modern school of 1920s Germany. Apart from the parliament building, Luckhardt's design provided for a new building for the parliamentary administration and political parties, connected to the main building. This structure was never built, however. The administrative offices of Bremen's state parliament were "temporarily" accommodated in the old Stock Exchange Annexe and, in contrast to other state legislatures, the parliamentary parties moved into premises in various parts of the city. It has remained so until today. 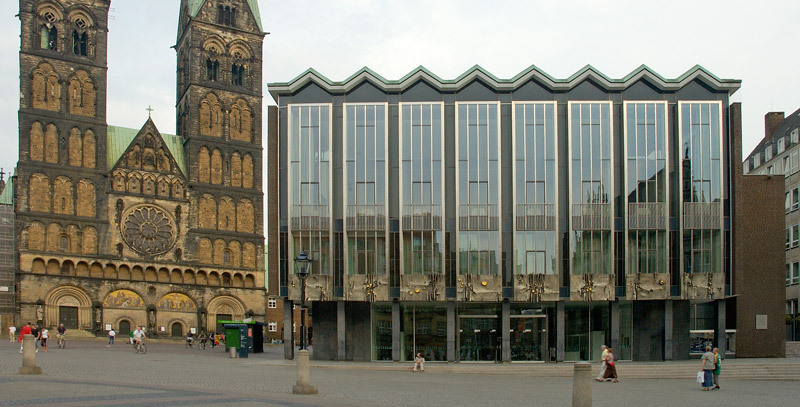 Bremen's parliament building is called "Haus der Bürgerschaft". It has a frame construction of iron-reinforced concrete. The sheathing of glass has been hung in front of this construction. The height of the building is approximately that of the level of the eaves of both the Town Hall and the house "Schütting". The folded roof was a compromise solution conceived as a means for converging and linking the building with the older buildings surrounding the historic market square. The facade of the parliament building reflects the old buildings in the mirror-like surface of the glass sheathing. 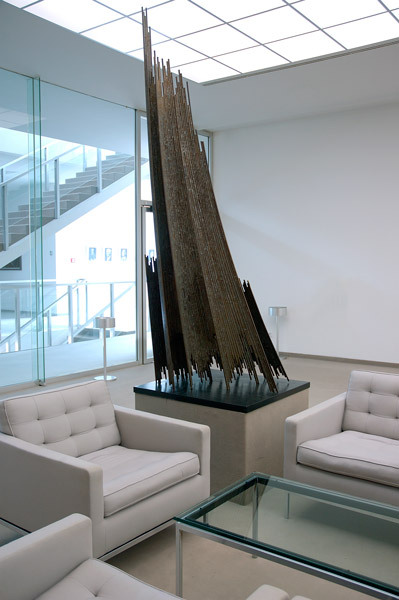 Artificial reliefs made of aluminium highlight the window sills. The outline of the "Börsenhof A" is in the shape of a semicircle. This floor plan is characteristic for the neo-Gothic style. The lancet windows stand in the same tradition. The main entrance to the building faces the old market square. It is encompassed by a glass front and the interior is ornamented with Carrara marble. The white and gray coloring and the height of the rooms create an ample spaciousness. On the first floor, four meeting rooms of unequal size and some offices are situated. They are arranged around the large middle hall. The President's office is located opposite to the large middle hall. The "Bürgerschaft" building and the "Börsenhof A" building are connected by a bridge. Inside the "Börsenhof A", there is an areaway that dominates the three galleries framed by arcades. The hexagonal assembly room forms the center of the building. This is where the representatives sit, in a bright, friendly atmosphere. The Bremen colours of red and white underline the light architectural style, which is achieved by means of a skylight construction and windows behind the visitors' gallery. A stylised state coat of arms made of anodised light metal decorates the front wall. 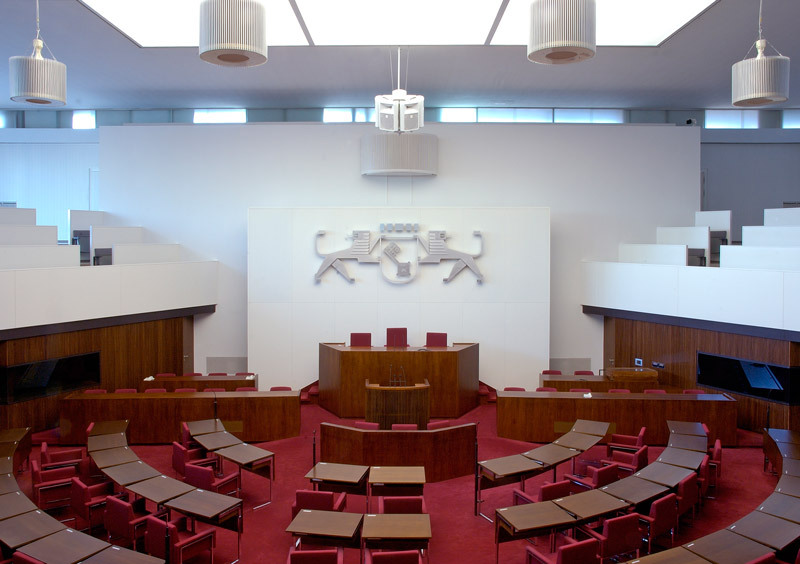 The 83 seats for the representatives are arranged in a semi-circle facing the lectern and the President's chair, while the "government bench" is situated to the right and left of the President's chair. In the gallery, 225 seats for spectators and thirty for representatives of the media allow direct attendance at the sessions.